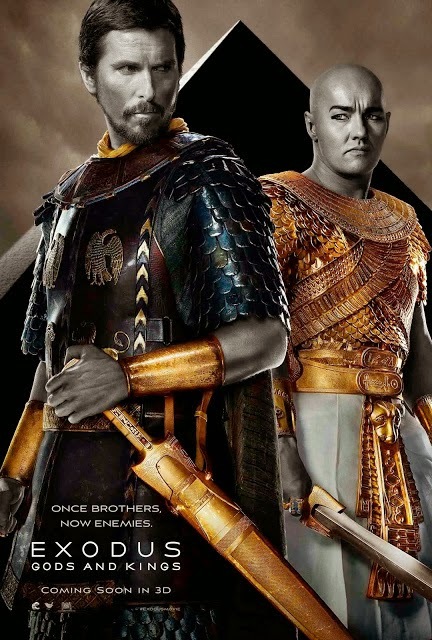 Fans of the 1956 movie, "The Ten Commandments" could have easily compare this re-telling of the story of Moses in "Exodus: Gods and Kings," but I tell you, this 2014 movie version is like no other. Director Ridley Scott must have seen ahead that people will initially compare his movie from the aforementioned film; I am glad he did, because this movie is really awesome! Before you read my review, let me just warn you about some spoilers that might be present in this blog post. But of course, "Exodus: Gods and Kings" is based on the Bible, so you won't be able to spoil much... except that, there are "ten commandments" coming towards the end! Hahaha! Anyway, on with the review! I made some points where you can compare it with the "The Ten Commandments" (1956) movie. "Exodus: Gods and Kings" is a modern re-telling of one of the famous stories in the Bible. While watching this, you will know that only God was working, and Moses (played by Christian Bale) is just doing his job as the "chosen one" and as the messenger of God. Director Ridley Scott has made this movie into a more scientifically accurate and explainable in nature. I like how he meticulously handled the "plagues" part where "one thing leads to another" and the parting of the Red Sea part where, well... not the one done with the 1956 film "The Ten Commandments". You will feel that God is working there with nature, and that no supernatural being or power from a prophet or an ordinary man is doing this kind of work. Just like what the title suggested, "Gods and Kings" were clearly defined with immense power and superiority. I like the way how Moses was depicted here in this movie -- like an ordinary man. He was weak, he has fears, has doubts, has no control of everything, and was somehow suffering from mild schizophrenia. Despite all what God has done to Moses and his people, there are some things that are for sure... that he is only human and that his faith and beliefs are stronger and larger than his life. Towards the end, the consistency of attack to this film by director Ridley Scott is awesomely good. You will believe that this movie is done with taste and artistry, and don't forget the choice of musical score (really fantastic!). I would definitely recommend this watching in 3D so that you will see the spectacular CGIs that were put in this film. For for viewing pleasure, below is the "Exodus: Gods and Kings" full movie trailer.